A day of loud and colorful debauchery doesn’t just happen. It requires planning. Case in point: Boston’s Pride Parade, taking place Saturday, June 11th. You can map out your day of revelry by checking out these must-hit parade day stops, perfect for colorful cocktails and people-watching as Boston’s most fabulous strut their stuff from Copley Square to Government Center. The mobile festivities depart from Copley at noon with a southward jaunt down Clarendon Street. You can put yourself in the parade path and post up for brunch and beverages before the day begins in earnest—thanks to its corner location on Tremont Street, The Beehive patio “is ground zero for the parade,” says owner Jack Bardy. “Lots of folks enjoy cocktails and brunch before, during and after the parade. 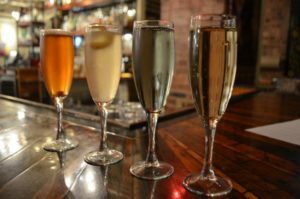 It’s a great, mature alternative to some of the more raucous Pride events of the day.” You can pair your eats with one (or more) of their Pride-themed cocktails, like The Rainbow with Cherry Heering, vanilla vodka, white chocolate liqueur and grenadine, or the Queen Bee with vodka, grapefruit, elderflower and Champagne. From there, the procession continues toward the Public Garden. So should you, with a detour to Trophy Room, a South End sports bar with enormous windows and a broad, open-air entrance that makes it a great spot to wet your whistle and cheer on the marchers. Before their post-parade block party gets underway at 1:30pm, stop in for a refresher. The drink list doesn’t disappoint, with options like the Grand Slam, a blend of Wire Works American Gin, Mathilde cassis and Pellegrino Oranciata. You can catch your breath and catch a couple innings of the game (Red Sox vs. Twins) without missing out on the sights and sounds of the parade. If you don’t know an RBI from an ERA, there’s still fun to be had in the South End—the march heads on to Government Center but you can circle back to the happening ‘hood to stake your place on the dance floor. Club Café is throwing a Pride DJ Extravaganza for the cut-a-rug types: starting at 2:00pm, a series of five DJs will play until the place closes down. (No cover before 8:00pm, either—dance the day away for free.) Afflicted with two left feet? Worry not. Tremont 647 and Sister Sorel also get in on the fun with a Carnival-themed Absolut party that starts at 10:30am at Sorel and moves out to the Tremont patio from 2:00-6:00pm. The adjoining restaurants will feature kegs of beer and special frozen vodka cocktails, enough to keep you cooled and fueled well into the evening. 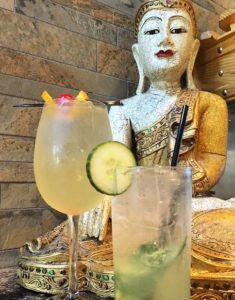 For even more libations, stop at Red Lantern, where cavernous ceilings and soft lighting are a welcome respite from the beating sun. You can cool down in the shade with one of the restaurant’s nine Pride-specific cocktails. Offerings include drinks like the Banana Hammock (Havana Club, Creme de Banana, Barrows and Frangelico) and Stonewall Sangria (proud white wine, Bacardi pineapple, pineapple juice, lime agave and mango nectar). Bring some friends along if you want to try the Queen Bey Bowl, a monstrous Beyonce-inspired tequila and vodka concoction that serves two to four people. The Pride Parade comes but once a year—with dedication and planning, there’s no reason to squander this annual fab fiesta at just one spot. A good rule of thumb? One cocktail for every color of the rainbow.